The glossary explains technical terms that are used in the Urban Water case studies. Some of the approaches to sustainable management of water can be complicated, such as stormwater harvesting technology and biofiltration. We have explained our projects in simple terms where possible, but in some instances the use of technical terms is required. This glossary section provides definitions for technical terms. An aqueduct is a structure that carries water above land. Brackish water is saltier than fresh water, but not as salty as seawater. It typically occurs where seawater mixes with fresh water, such as in estuaries. The lower section of the Yarra River, up to Dights Falls, is brackish and tidal. A catchment is an area where water is collected by the geographical features in the landscape and flows under gravity to a single point. In urban areas, catchments are less visible to the naked eye because drainage pipes are commonly located underground. A culvert is a structure that allows water to flow under a road, railroad, trail, or similar obstruction. Typically buried beneath the ground, a culvert may be made from a pipe, reinforced concrete or other material. Ecosystem services are the direct or indirect contributions of ecosystems to the health and wellbeing of humans and animals. Ecosystem services are a result of natural processes that transform natural assets (soil, air, water, plants) into things that we value, such as clean air and water, fertile soil, climate regulation and plant pollination. Filter media is a type of substrate that is designed to filter pollution or debris from water. Filter media is used in raingardens and raingarden tree pits. Fit-for-purpose water use prioritises the appropriate quality of alternative water sources for different demands. The closer the match in the quality of water to the level needed for the end use, the less treatment is required. Reducing water treatment is both energy and cost efficient. Drinking water is saved for drinking, and recycled stormwater is used for irrigation and other non-consumption purposes. Geotextiles are permeable fabrics which, when used in association with soil, have the ability to separate, filter, reinforce, protect, or drain. Geotextiles can be used to line infiltration trenches or pits, and can also be used as a tree root barrier. 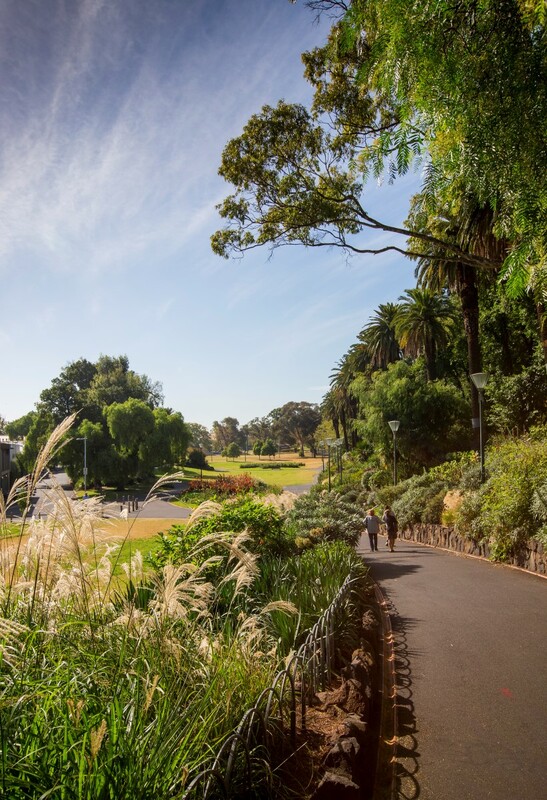 Green infrastructure is the network of natural landscape assets that underpin the economic, social and environmental functionality of our cities and towns: the green spaces, water systems and built landscapes. Collectively, the various green infrastructure elements are known as the ‘urban forest’. Raingardens, swales or other water sensitive urban design features that use plants. Hydraulic conductivity is the rate at which water is able to pass through a substance or material, such as soil. For example, if the substrate in a raingarden has low hydraulic conductivity, it means the water is soaking through the substrate slowly. 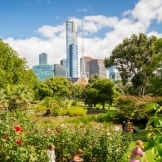 The levelised cost is a measure that the City of Melbourne uses to determine the cost of water from a stormwater harvesting system, factoring in the cost of construction and maintenance. Capital expenditure is the total construction and design costs, and design life is based on a conservative concrete tank life expectancy. Annual operational expenditure includes energy, consumables, labour, regular pump maintenance, GPT clean-up and replacement cost of items like pump, averaged over the expect life of the item (10 years for pumps). Liveability is defined as a measure of the attractiveness of a location as a place to live and work. Economic, social and environmental factors all influence liveability. 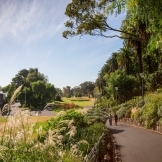 These include the quality of the natural and built environments; amenity; access to education and health services; and cultural vibrancy (Victorian Competition and Efficiency Commission, November 2011). Water drainage infrastructure manages the risk of floods impacting on the community. A micron, also known as a micrometre, is a unit of measurement for length, commonly used for measuring biological cells and bacteria. One micron is equal to one millionth of a metre (0.001 millimetre). Model for Urban Stormwater Improvement Conceptualisation (MUSIC) is a stormwater-modelling program. It is used to test the likely effectiveness of different stormwater treatment systems in a given setting, based on rainfall data, hydrological information and water pollution readings. For example, music modelling could be used to determine the appropriate tank size and location for a stormwater harvesting system or household rain tank. Online water quality testing is most commonly installed into systems where captured water will be used for irrigation of public green spaces. This ensures that the water is safe for human exposure and suitable for watering plants. One of the key benefits for online testing is that any water quality issues are detected immediately and can be addressed before the water is reused. A permeable surface is made of material that allows for water to pass through its structure. For example, most types of soil are considered to be permeable because water is able to soak through the particles. Soil permeability is an important part of the water cycle, allowing rainwater to infiltrate the ground and replenish underground aquifers and groundwater supplies. An impermeable surface is one that does not allow water to pass through causing it to run over the surface instead. Urban areas are dominated by impervious surfaces, such as roads, footpaths and buildings, which prevent water from soaking through to the soil. The impermeable surfaces in urban areas capture the water when it rains, causing flooding and stormwater problems. Potable water, also known as drinking water or mains water, is water that is clean enough to be safely consumed by humans. This usually requires some level of treatment to remove contamination and is closely monitored to ensure it meets health regulations. In Melbourne, most water requires only minimal treatment because it comes from closed catchments. For more information about water treatment processes, visit http://www.melbournewater.com.au/whatwedo/supply-water/pages/water-treatment.aspx . Potable water is distributed via a network of pipes into buildings and public spaces. Traditionally, this water has been used for all purposes, from drinking through to watering gardens and flushing toilets. The uptake of whole of water cycle thinking is leading to more sustainable water-use practices where potable water is reserved for drinking. Alternative sources of water, such as rainwater, are used when high quality water is not required, such as toilet flushing. Stormwater is the term used to describe rainwater that is collected on sealed urban surfaces. Stormwater is considered to be dirty because it collects pollution from the surfaces it comes in contact with, such as roads, soil and concrete. Stormwater flows directly to our waterways and can contain litter, oils, hydrocarbons, sediment and nutrients that concentrate in our rivers and bays. 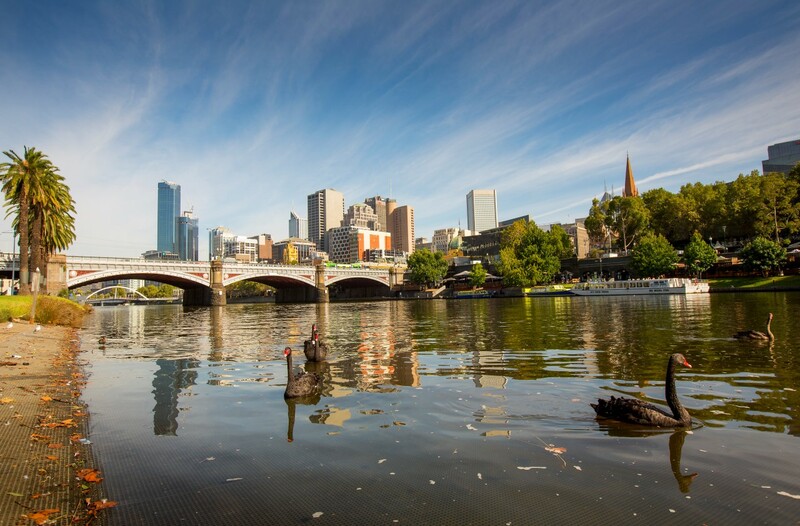 It is estimated that up to three billion pieces of litter (between 2000 and 3000 tonnes) wash into Melbourne’s waterways each year. Stormwater drainage networks allow stormwater that accumulates on sealed surfaces to flow away, preventing flooding. A network consists of gutters; channels and underground drain pipes. In Melbourne the stormwater drainage pipes are usually separate from the sewerage pipes and discharge stormwater directly into the river system. Structural cells are plastic modules that are laid beneath the ground. They provide a growing environment for trees that can also be paved over on top. The cells are filled with soil. Substrate is material that trees or plants can be grown in. The composition of the substrate will vary depending on the location and desired outcomes. For example, on a green roof a lightweight growing substrate might be used to reduce the load on building, while a sturdy structural soil might be used to plant a tree in a high traffic location. 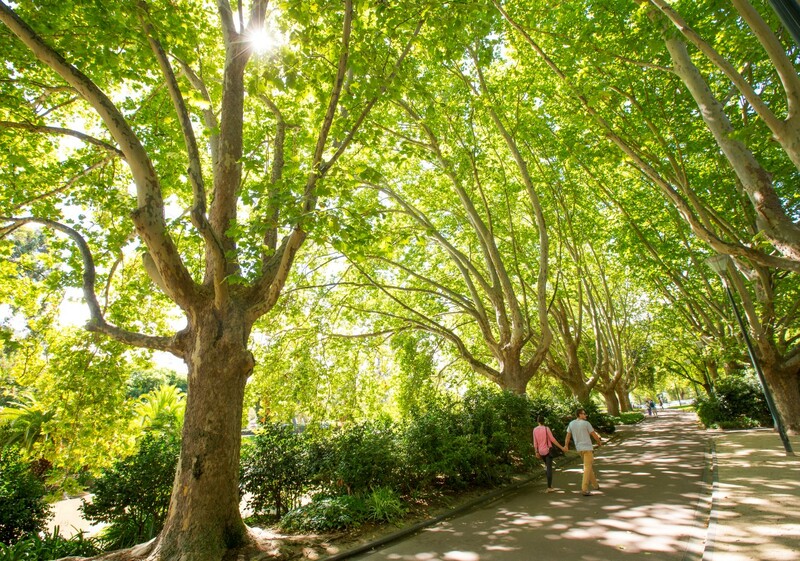 The ‘urban forest’ is a term used to describe all of the trees and other vegetation in the city, and the soil and water that supports them. This includes alternative greening such as green roofs, green facades, raingardens and balcony plants. 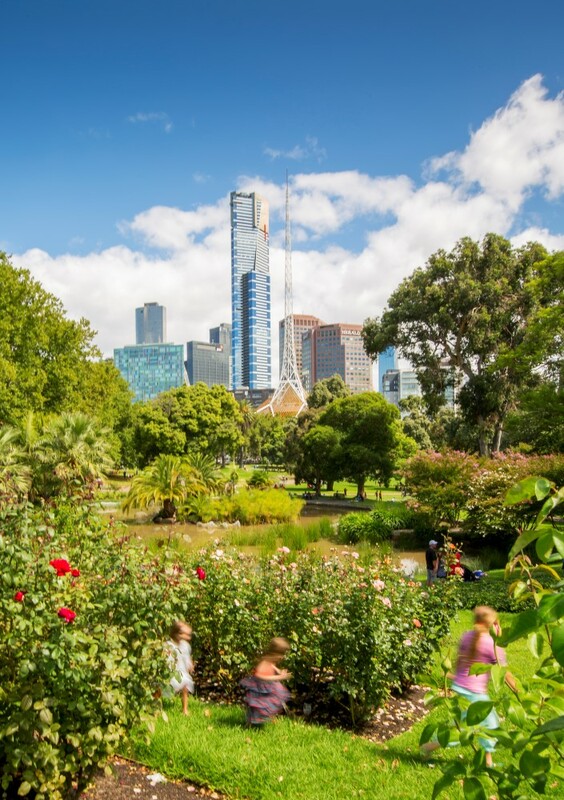 Creating a healthy, diverse and resilient urban forest in Melbourne is the focus of the Urban Forest Strategy. 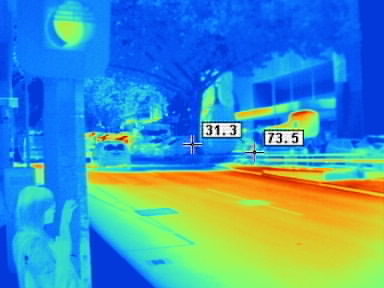 Impervious hard surfaces: Buildings and pavements have high heat absorption capabilities. Asphalt and concrete trap and store heat from the sun for extended periods of time, while solar radiation is reflected off buildings and intensifies the heat in the streets. Human activity: Motorised transport contributes greenhouse gasses and heat to the air and in hot weather the use of air conditioners in homes and offices generates waste heat. Low vegetation coverage: With less vegetation, cities receive less natural cooling from shade and evapotranspiration. Urban heat islands occur all year round, but they become a problem during the warmer months and will continue to worsen as the climate changes. In addition to damaging the health of vegetation in cities, the extreme heat also impacts on the health of the community. 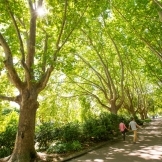 Creating a healthy urban forest is a proven method for mitigating the urban heat island, because the vegetation cools the city through shade and evapotranspiration. A healthy urban forest relies on a sustainable supply of alternative water. Ultra-violet disinfection, known as UV disinfection, is process used to remove bacteria from water. The water is passed over short-wavelength ultra-violet light to kill or inactivate the microorganisms. This process ensures that recycled water does not pose a safety risk to people when it is used for irrigating public spaces. Whole of water cycle management is an approach that considers the entire water cycle, rather than managing each component separately. It links together water supply, wastewater, stormwater and waterways, and includes the community, businesses and government in the process.